Gamespot is running a promotion. Basically enter your email address and get a code. You'll get a casting companion plus some enchantments, refining stones, injury kit and healing potions. 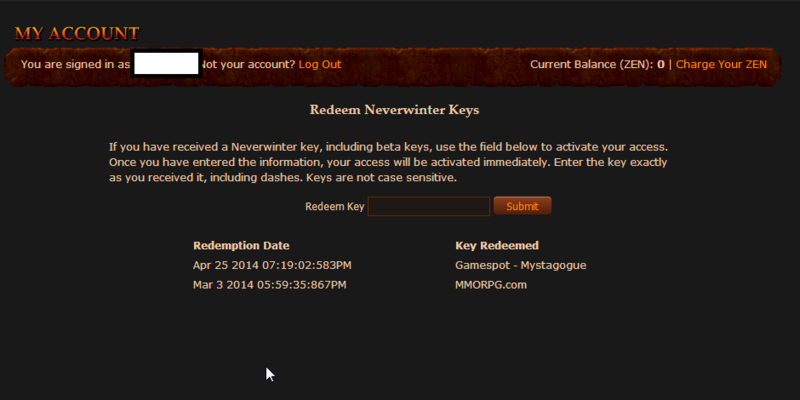 Go to Neverwinter - Mystagogue Companion Code Giveaway - GameSpot and follow the prompts. It says you need the ARC client installed. But you do not. Simply go to https://my.perfectworld.com/nw/redeemkey and redeem the key you get there. I did the above method myself. And it works. So yeah. See below for an image (after Hekson's reply). Last edited by DrLecter; 04-26-2014 at 07:24 AM. One piece of info for those who are interested - you need to have Arc installed, otherwise it's a no-no. Anyways, very nice find DrLecter, thanks! Hehe, thanks for the update, I really hate using Arc, so this is a welcome update. EDIT: just inserted my code, got the rewards, everything works fine. Last edited by Hekson; 04-26-2014 at 07:39 AM. Still working nicely, thanks for the info DrLecter!